It was three years ago when I first wrote about the invasion of the Thames by Chinese mitten crabs – so called because of the dense hair on the back of their large claws – and I wondered whether readers of this column had spotted more examples in our stretch of the river. These crabs are native to parts of eastern Asia – from Korea to China – but they have been transported all over the world in the ballast water of cargo ships. It works like this. The cargo ship arrives in Asia and unloads its cargo. If there is no cargo to take on board for its return journey, the stability of the ship is dependent on taking on board water into its ballast tanks and that water can contain the larvae of mitten crabs. The ship arrives in a European or North American port and pumps out its ballast tanks and, hey presto, you have mitten crabs in your local rivers. The creatures live mostly in fresh water, although every four or five years they have to make their way back to the sea to breed, and when the new generation are born, they head back into fresh water. So what? You might ask – well, the fact is that they can become a real problem if allowed to get out of control. Many European rivers are already infested with the things, which tend to like burrowing into mud banks to make their nests. And it doesn’t take a genius to work out that if you have thousands of mitten crabs making holes in the banks of your rivers then eventually the banks are going to become unstable and start to collapse. Not to mention the effect they can have on the native species including freshwater shrimps and crabs, fish and eels. Mitten crabs have few natural predators. You might think that with much of the lower reaches of the Thames given over to residential and industrial building and the banks reiniforced by steel pilings or concrete, that mitten crabs wouldn’t present too much of a problem for us. Think again. These creatures can travel miles from the water and head upstream to where the banks are less protected and there is plenty of food for them. When I first raised the topic, the Natural History Museum had just completed a survey showing that the crabs had already moved into the non-tidal Thames above Teddington and that sightings of them had been made as far up river as Molesey and Sunbury. What I’m wondering is whether readers have their own personal experiences of seeing mitten crabs anywhere between Molesey and Runnymede. How would you know a mitten crab if you saw it? Well, apart from the characteristic hairy claws, the crabs can grow to the size of a dinner plate with a carapace of up to four inches in diameter and long legs. Do let me know if you’ve encountered them. 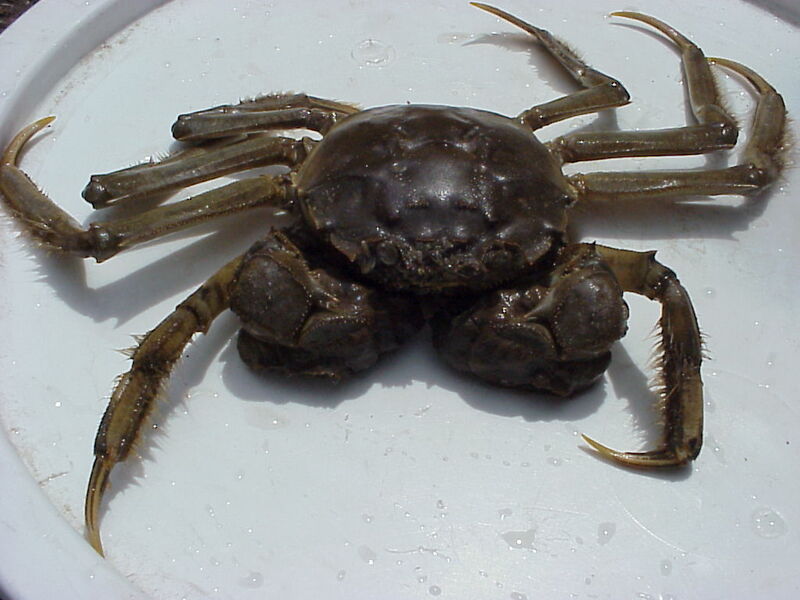 As an aside, mitten crabs are considered to be a real delicacy in China and some other Asian countries and the enterprising Dutch have found a clever way of trying to deal with the invaders by catching them in large numbers and shipping them back where they came from! They never miss a commercial opportunity, the Dutch! DO you have a river-related story you’d like me to cover? If so, email me at mort.smith [at] trinitymirror.com or call me on 07760 361106.